70% of payments received by Snapdeal originate via mobile phones; and Kunal Bahl, founder of Snapdeal is very keen to enhance their presence across mobile phones. In a masterstroke, Snapdeal has re-launched Shopo as an app based market place with zero commission; which means that Shopo will not charge any commission on the transactions which are happening there. Back in 2013, Snapdeal has acquired Shopo, which was an online marketplace for Indian designer and handcrafted goods that time. No requirement of providing PAN card, TIN/TAN number or VAT registration. Sellers just need to upload the image of the product, and buyer just needs to agree to the price. 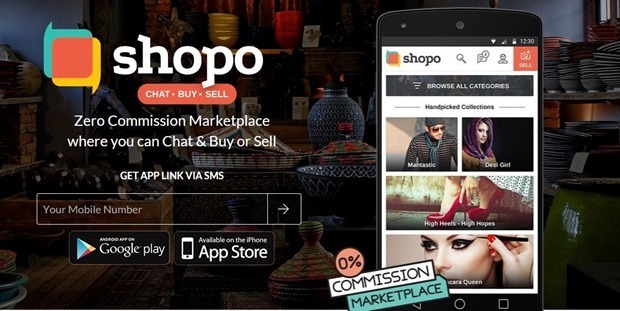 The ability to chat and negotiate the price is a feature which enables Shopo to compete with bigger M-Comerce players such as PayTm, who had introduced a similar chat and negotiate platform early this year. And the zero commission model adapted by Shopo makes it a competitor of Quikr and Olx, which are online classified sites, but lately they have been adding features which will soon make them an online marketplace. Shopo doesn’t provide any logistics platform or payment gateway; both buyer and seller need to figure it out how the product will be delivered and how the payment shall be made. However, in future, they may add an online payment gateway, which will further boost their platform. The intentions are quite clear here: Snapdeal wants to dominate the mobile+digital ecosystem as evident from their earlier acquisition of Freecharge and RupeePower, both of which are mobile based startups. Additionally, this relaunch comes barely weeks after Flipkart announced that they will be converting into an app only portal. And on the other hand, Snapdeal wants a bigger pie of the e-retail market, as they wish to include more and more sellers into their platform. While Snapdeal, which is India’s biggest marketplace as of now, caters to the organized sector with requirement of PAN card and other documents for becoming a seller; Shopo will cater to the unorganized sector, and would gradually nurture them towards Snapdeal platform. Interestingly, around 4,50,000 sellers were rejected by Snapdeal due to lack of paper work. Shopo can be the perfect destination for them now. Shopo would be headed by Sandeep Komaravelly, who was Senior vice-president, marketing and communications, at Snapdeal previously. The beta version of Shopo already has around 30,000 listings done by 4500 sellers.